Tree to 30m tall, dbh upto 1m; crown narrowly conical. Bark in old trees scaly and fissured. Branches spreading horizontally, the upper ascending, young shoots hairy. Vegetative buds ovoid conical, acute, 3–4 x 2–3mm, not resinous. The non-resinous vegetative buds and the hairy young shoots distinguish this from A. cilicica subsp. isaurica. These minor and sometimes variable differences have led some to believe that these two taxa belong to the same species. This subspecies is endemic to the mountains adjacent to the north-eastern Mediterranean coast where it occurs in: Lebanon: from the northern part of the Mount Lebanon range, reaching its southernmost limit in the forest of Horshe Ehden and has a limited and fragmented distribution in three locations – Ehden forest, Qammoua Mountain, Ain Toffaha NE of Seer Eddeniyea; Syria: it occurs at Slenfch (Lattakia); Turkey: the largest subpopulation is in the eastern Taurus Mountains. In Turkey it has an altitudinal range of 1,000- 2,000 m. (Davis, 1965) where it is repressented by 640km² of pure forest (Bozkus, 1988), but throughout its range it mainly occurs in mixed forests which is estimated to be 1733km² (Bozkus, 1988), mostly with Cedrus libani. Other asociates include Juniperus excelsa, J. oxycedrus, Populus tremula and Quercus libani. In Syria it grows with Ostrya carpinifolia, Carpinus orientalis, Sorbus torminalis, Fraxinus ornus and Cerasus mahleb (Browicz, 1982). In Lebonon it is often the dominant species but can also occur with Pinus brutia, Juniperus oxycedrus, J.excelsa , Sorbus torminalis, Acer spp. and Quercus spp. Throughout its range it occurs on calcareous substrates which are shallow, rocky and well drained. Abies cilicica subsp. cilicica has a relatively wide distribution with an estimated area of occupancy of 2547km², 95% of which is in Turkey. The Mediterranean vegetation of southern Turkey, especially the montane areas, is considered to be at high risk from climate change (Ozturk, 2010). Records clearly show that summer temperatures are rising and in the last five decades the annual rainfall has decreased significantly. These trends are creating an increased risk of fire, and are also contributing to a decrease in the general health of the trees which in turn makes them more vulnerable to pathogen attack. The Taurus Mountains are also seeing a big increase in the number of tourist which also increases the risk of forest fire (Ozturk, 2010). If these negative trends continue then this species could qualify for Vulnerable under the subcriteria for B2. However, at this stage an assessment of Near Threatened better reflects its relatively limited area of occupancy and the current extent of decline. It has a limited and fragmented distribution in only three locations with an AOO of 10km² (Talhouk et al, 2001) where there is a continuing decline in its extent of occurrance, area of occupancy and quality of habitat due to many negative factors.The sub-population is very fragmented and degraded due to ongoing pressures from urbanization and associated development and historically due to the wood being used for building railways. The forest of Qammoua is one of many examples of ongoing over–exploitation of forests in marginalized rural areas with villagers cutting large quantities of wood for fuel and grazing their livestock in the forest for most of the year. (Beals, 1965; Talhouk et al., 2001). Illegal logging and poor forest management are further threats to the forest (Ministry of Environment, 2011). 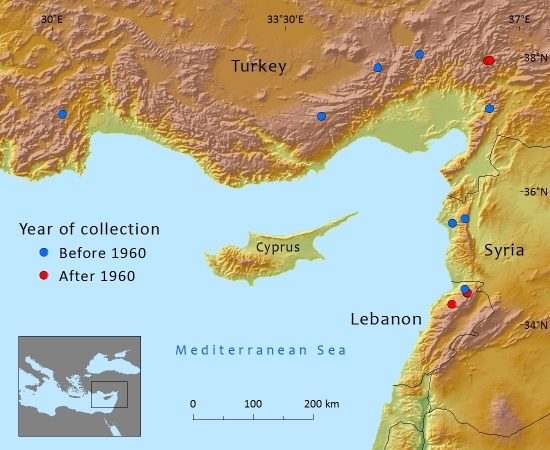 In Lebanon much of the forest destruction occured in the 16th century (when logging became an alternative form of tax payments, and as a result increased uncontrollably) and further felling occured during World War I. (Talhouk, 2001). These forests are under less threat than those in Lebanon and Syria, however large areas are in a state of degradation with 44% of the pure stand forests and 86% of the mixed stand forests degraded (Bozkus, 1988). Much of this has been casued through over–grazing by feral goats which has had a negative effect on regeneration (McGinley, 2008). Other threats include fire (partially as a result of an increase in tourism in the Taurus Mountains) and pathogen attack. There have also been reports of sudden mortality (Carus, 2010) and a decrease in the health of forests due to increased summer temperatures and reduced precipitation that have been attributed to global warming (Ozturk, 2010). Even with these threats the subpopulation, which has an estimated AOO of 2524km² representing more than 95% of the population, falls outside of any of the threat categories. This species is protected in National Parks throughout its range. Examples of protected areas are: Lebanon: Horsh Ehden Nature Reserve; Turkey: Kovada Lake National Park; Olimpos-Beydağları National Park. Syria: Latakia Reserve. Atalay, I. and Efe R. (2010). Structural and distributional evaluation of forest ecosystems in Turkey. Journal of Environmental Biology. 31: 61-70. Beals E.W. (1965). The remnant cedar forests of Lebanon. Journal of Ecology. 53: 679–694. Davis, P.H. (ed). (1965). Flora of Turkey and the East Aegean Islands. Vol.1. Edinburgh University Press, Edinburgh. Gardner, M. & Knees, S. (2013). Abies cilicica ssp. cilicica In: IUCN 2013. IUCN Red List of Threatened Species. Version 2013.1. <www.iucnredlist.org>. Downloaded on 07 July 2013. Government of Syria. (1995). Syria: Country Report to the FAO International Technical Conference on Plant Genetic Resources. Damascus. Kaya, Z. and Raynal, D.J. (2001). Biodiversity and conservation of Turkish forests. Biological Conservation. 97: 131-141. Ozturk, M., Gucel, S., Kucuk, M. and Sakcali, S. (2010). Forest diversity, climate change and forest fires in the Mediterranean region of Turkey. Journal of Environmental Biology. 31: 1-9. Rolley, J. (1948). Forest conditions in Syria and Lebanon. Unasylva 2(2): 77-80. S.G.Knees,and M.F.Gardner, 2015. 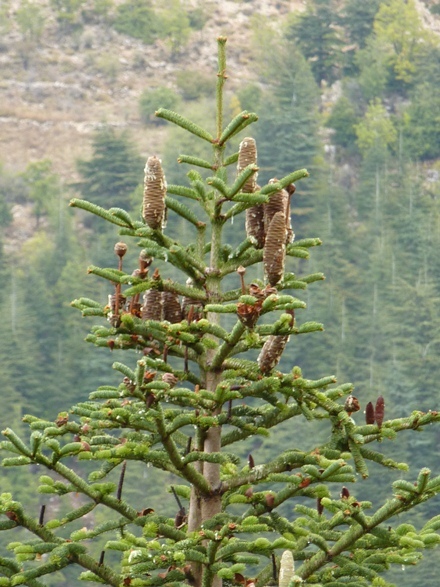 Abies cilicica subsp. cilicica, from the website, Threatened Conifers of The World (http://threatenedconifers.rbge.org.uk/taxa/details/95).